Winter has come to the mountains and I think I may now have a partner who is pumped to get in it. Brent and I have been starting to accrue the needed gear. 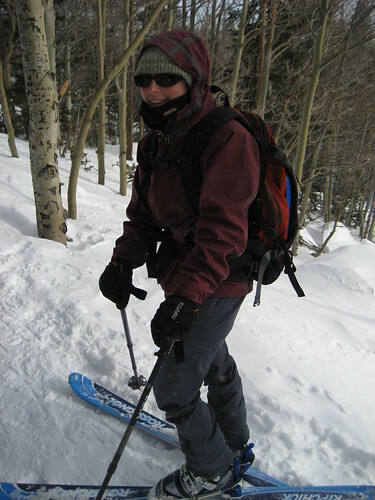 I scored a killer pair of winter mountaineering boots on Mountain Project. Still on the lookout of a pair of used ice tools. Doug mentioned selling me his but he may of been joking. How rad would it be to have Snivley's old ice tools! Along those same lines, I just watched a movie with my nephews about these guys back country snowboarding. Wow, it pumped me up. Heck it even pumped Molly up! It is called "On my own two feet". I am ready to burn those stupid tele-skis and commit to my board. Sorry Arnold! Furthermore, the movie has the nephews pumped up for spring break. There is big talk of a 4 day igloo/back country snowboarding trip and I am starting to scout locations. 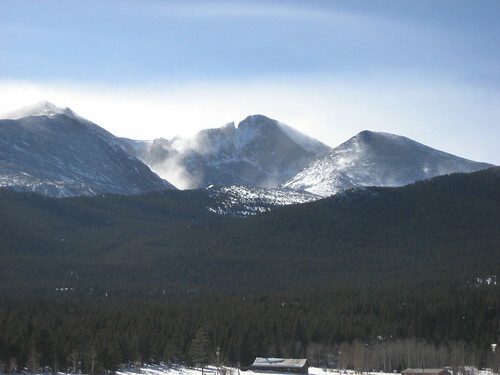 It'll probably be in the Indian Peaks area. 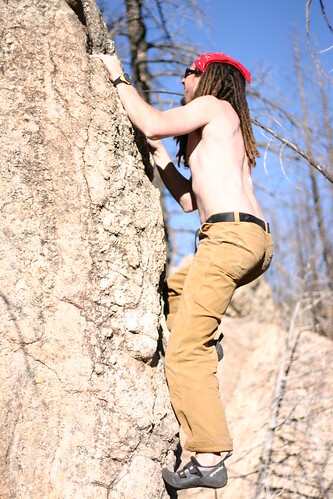 Every time I go out rock climbing I fall in love with it even more. I have lofty goals for this year. My head is starting to catch up with my strength (I hope). I have a 5.11d trad route picked out as a project. Brent is pumped to get onto some long alpine route. Perhaps the Diamond is on the list but it still seems too daunting to say it out loud. I'll definitely be hiking back up to Castleton with Joe in the spring. 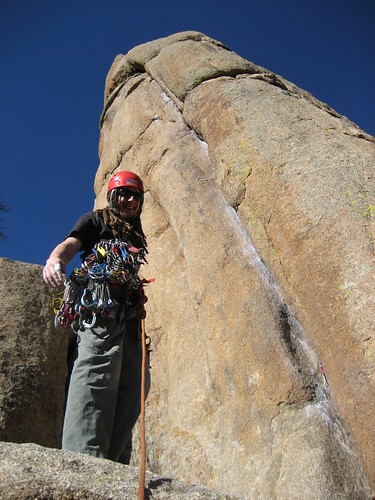 I would like to get up a 5.12d sport route called Psychatomic. And this is all on top of an ever growing hit list of routes in Lumpy! As for work, this coming year is shaping up to be a make-or-break year. Our software is finally going to be released in March. All indications point to it being a great success but you never know. If it is just a fizzle... well, I suppose I could always go back to school and finish my PhD. Hmmm, what else. We'll probably get a new truck before the end of the year. Molly has been swimming 4 times a week and is talking about a triathlon. Hang on! It is gonna be a good year! Check out this sweet video that Microsoft released. Granted, much of it seems simulated but the vision is awesome. I am anxious to see how much of this is "real". Of course Sony has some new stuff too. Their video isn't as slick as the xBox but the tech demo seems more realistic. I came across this video which shows an interesting idea for "fish tank" vr. Note there is not stereo (shutter) glasses but because of the head tracking you still get a really nice stereo effect. May have to try this with the Wimote head tracking. "Science leads you to killing people"
OK, so I always though Ben Stein was a reasonably bright guy even though I was not too impressed with his "Expelled" movie. But then I came across the most amazing quote from him... "Science leads to killing people". Now I know what you are thinking because I would think the same thing with a quote this ... nuts. It must be taken out of context or made up. That I why I am posting the video here. His is talking about the holocaust. I find it incredible, even astounding that he would say something like that. It is even more appalling that the interviewer agrees with him. Tomorrow as you go through your day take note of all things in your life that have been created (or at least enhance) by science. The food you eat, the car you drive, most likely your lively hood are all affected by science. In fact, I cannot think of a single aspect of life that has not been affected by science. If Stein wants to maintain any credibility he has two choices. Take it back or simply start a movement where he treats science like vegans treat meat. On second thought, neither of these would restore any credibility. His ship has sailed. So the Foxes came to town and that means a lot of partying, very little sleep, and excessive amounts of climbing. For those that don't know Jim and Julie (and fam, now! ), they are a great couple we met back in Iowa a few years ago. Jim and I climbed a ton together back there. 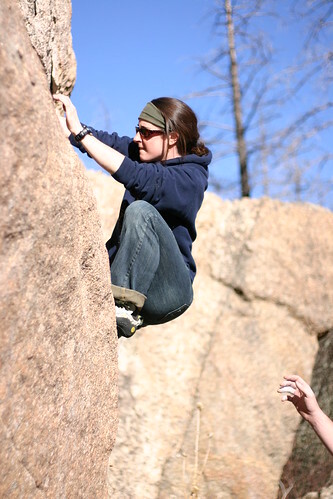 We went at least a full year of climbing outside every week, rain or shine. This is quite a feat, considering how cold it can get in Iowa! Many 5am starts in subzero temperatures. Anyhow, with Jim in town I wanted to do something pretty big. Jim is a solid trad climber and we have had lots of fun climbing together at the Red in KY (where they currently live), but we have never been on anything longer that two pitches. We had talked about doing some alpine stuff in the park but after getting some beta from a local guide we decided to switch our target to something in Lumpy. When looking at Lumpy ridge from town, the climbs with the longest approach are on the Sundance Buttress, so naturally, we had to climb that. 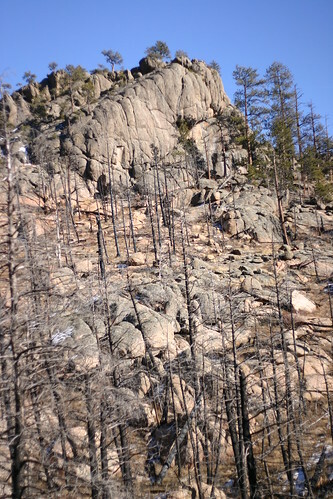 Plus it is the most imposing looking buttress on the ridge, except for maybe the twin owls. 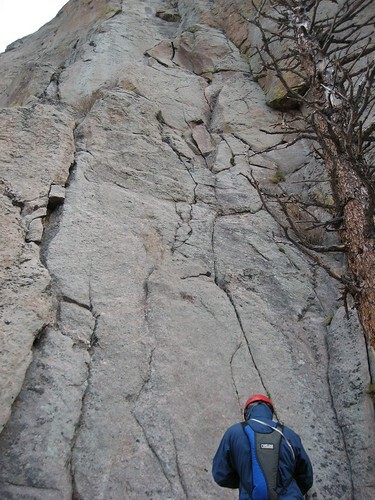 The classic route up the buttress is a 6 pitch 5.9 called Mainliner. Perfect! 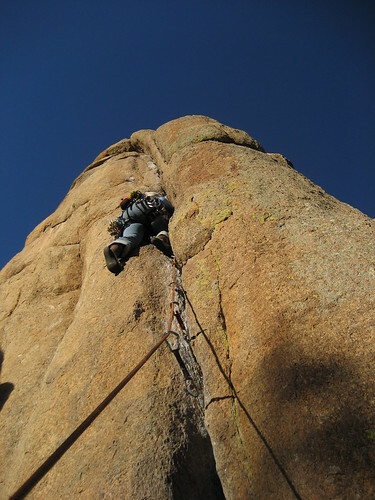 I had been eying this climb for a while now but it is pretty committing so it was nice to have a partner that was pumped to get on something big. We cruised along the Black Canyon trail, passing the familiar turns to the Book and the Pear. After about an hour we arrived at our turn to Sundance. Up to here the trail had been pretty flat but after the turn, you were rudely reminded that you are in the Rockies. Another half an hour of hard hiking ushered us to the base of the buttress, where it was surprisingly cold. The hike and late night was not agreeing with Jim so I got to take the first lead. Here is Jim at the base of the climb as we are getting ready to start. 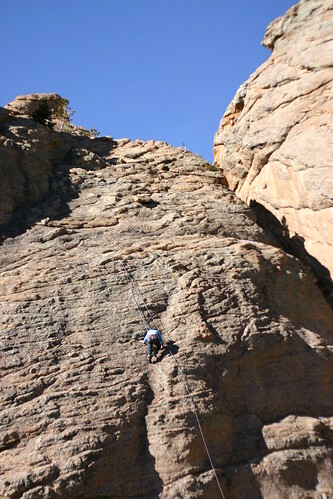 The route started with a hard layback right off the deck but then quickly eased to fun climbing with good gear. You can see the starting crack on the far right of the picture. It has been a while since in have lead trad on such steep rock but the holds were good and you could get pro anywhere you wanted. Unfortunately, even with Eli's great description of the route (here) I still managed to get suckered off route in a crack that blanked out 15 feet shy of the belay. Looking down, it was obvious that I should of traversed to the left much lower but now I was committed. 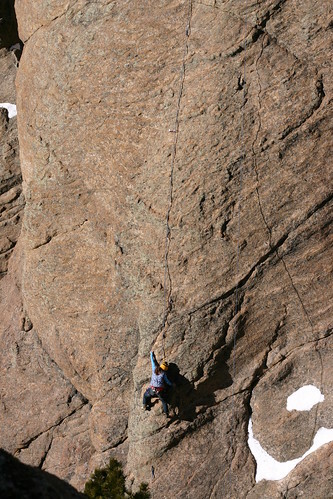 Up looked hard and runout so I focused on a delicate traverse to the good holds about 12 feet to the left. Unfortunately, this zig zag path was going to cause some serious rope drag plus put Jim in a serious position if he were to fall following the traverse. The only way to avoid it was to run it out as much as I dared before putting in some gear. Fortunately, the holds were good and I managed a fairly respectable runout. After a bomber nut and an airy traverse back to the right, I arrived at the first belay ledge, a tiny stance just above a roof (just visible in at the top of the picture). To me, this felt like a long pitch. I would guess it to be pretty close to 50m. 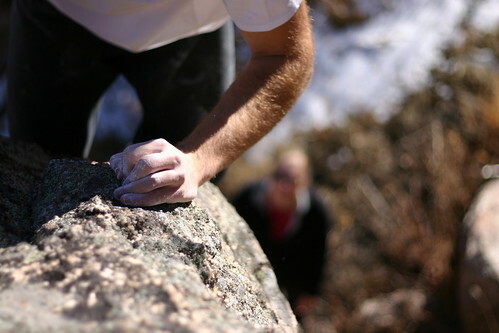 Jim climbed up and cursed his way thought the traverse. He spent some time at the cramped belay ledge trying to gather his cookies. 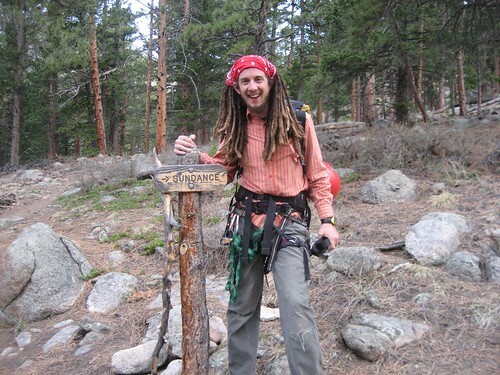 The altitude, partying, and long hike was conspiring against him but a power bar and water brought him around, and once he started the second pitch he began to find his rhythm. 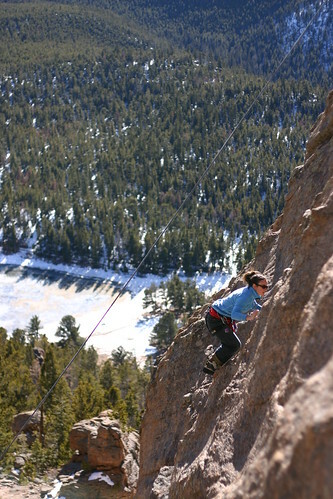 Pitch 2 started out on low angled rock that was loaded with good crystals making the climbing easy. After about 50 feet it gets steep again and you have to pull through a steep but short crack to gain a series of small ledges. Eli's page said to go 100' to a ledge but in retrospect, I think we should of gone further. Our first belay might of been lower than his. Anyhow, Jim found a nice ledge at 100' and brought me up. By this time, I had the whole body shivers going. Full on convulsions from the cold. All I could do was sit there and watch the sun slowly creep towards us and hope the cold wind would die down. This ledge put us at a crack that leads up to the famous stem box. After some head scratching we realized that we must of been too short on our pitches because Eli's page describes this as part of the second pitch. Even more glorious that the stem box was the sun hitting the rock about 10 feet above the ledge. I re-racked quickly and jammed my way into the to warm embrace of the sunlight. The stem box was some pretty cool climbing with awesome small nut placements. It would probably be tough if you were short, though. I wished I had done some stretching before getting into it. 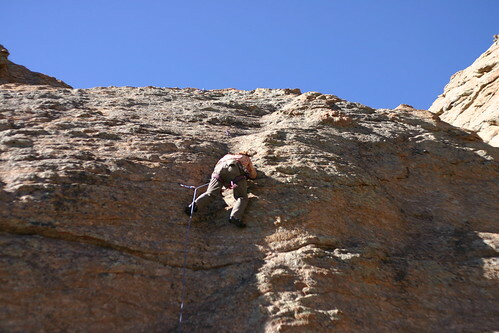 I set a belay at the base of a steep hand crack leading into a left facing corner, which matched Eli's description of pitch 3 and brought up Jim. This pitch felt pretty short, probably less than 100'. Here are some shots of Jim coming though the stem box. 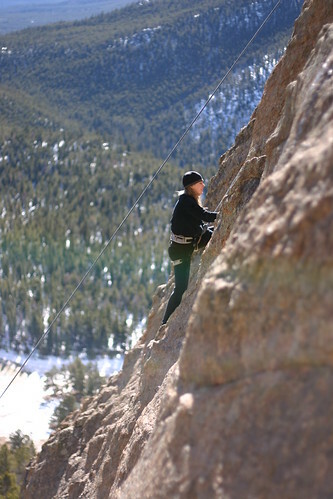 After about 100' he set a belay on a nice sloping ledge and brought me up. I took the rack and headed off, hoping to get to the top of the route. After about 30 feet of moderate climbing the difficulty eased. But then I ran into the final crack. A wide flaring crack. I took off into it but only had one big cam left. I managed to get about halfway though it before I had to place it. I kept scooting up hoping to find some smaller stuff that I could protect but it became obvious that I was going to need some more big stuff to protect it. So I down climbed it, set a belay and brought up Jim. 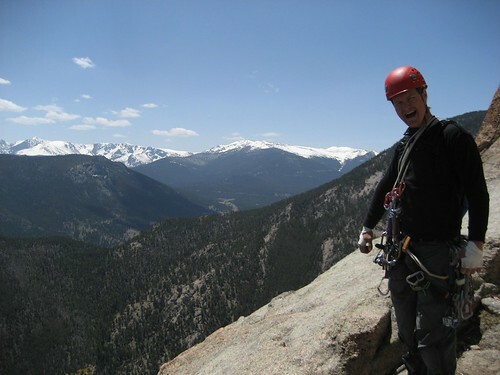 Here is a Jim joining me at the belay. He is still a bit cold. The descent was as advertised, exposed 4 class steps. I sure would not want to do that in the rain. The hike out was long and hot with a nice surprise, Molly was waiting on the trail below the Pear to cheer us on. Then it was off to Ed's for fish tacos and a cold brew. What a day! Stats for the nerds out there. Approach took us 1.5 hours. My watch died during the ascent so I am not sure of the rest of the times. We left the TH at 5:30 am and were back to the car around 4pm. For a rack we had double cam up through the blue and a good selection of nuts. 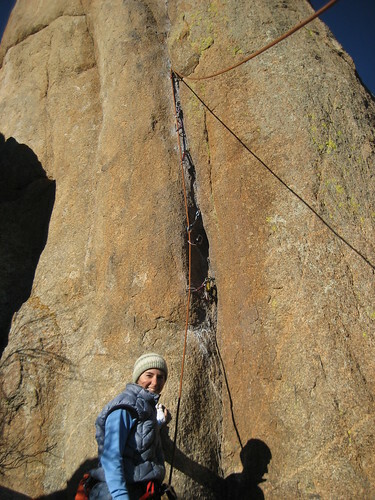 This route has awesome nut placements throughout. A few weeks ago Brent, Molly and I headed up into the snowy back country of RMNP for some skiing (Molly and I) and snowshoeing (Brent). Simply put, we had a blast. We just got a fresh dump of snow and the weather was perfect. You could not ask for a better day. We did the usual Flattop tour up the Flattop trail for a bit then coming down the easy north-east slopes to join the trail that goes to Notchtop. Here is a vid I made of the trip. Time lapse photography is one of those things that I have been wanting to try out for quite a while now and I finally got around to it. This involves setting up a tripod with your digital camera on it and taking several pictures at regular intervals for a long period of time and then string them together in a video. What I have never been able to figure out is how to get the camera to take pictures at a regular interval without having to sit there and push the button or lug a laptop around. However, though the power of the internet I recently discovered that I can actually turn my old TI-85 calculator (yes, calculator) into a intervalometer, which is a fancy word for something that causes your camera to take pictures at regular intervals. Here is my journey so that others may learn. So, as it turns out, the output jack on a TI-85 and the remote trigger for my Digital Rebel are both 2.5mm stereo audio jacks. This is similar to a typical headphone jack but a bit smaller. To trigger the camera to take a picture you simply need to pass some voltage though this and snap! Conveniently, you can write a simple program in the calculator to do just that. 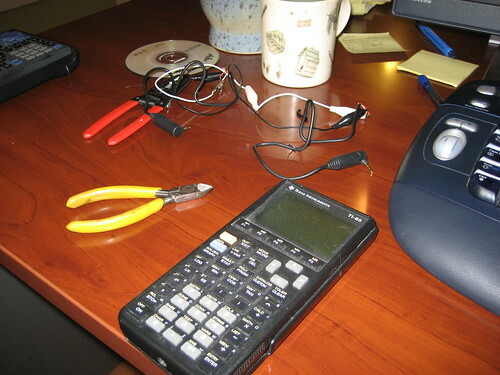 So first thing was to find, dust off and replace the batteries in my old TI-85. What this simple code does is prompt for a value for A and then sends a signal down the cable at a steady interval, based on A. I am not sure but I think A is the number of program loops to do before sending a signal. Whatever it is, setting A to 100 gives you about one signal a second. Next it was time to hold your breath and make the connection. I plugged the cable into both devices and let 'er rip, praying for no smoke from the camera. Fortunately, there was no smoke but there was no shutter action either. 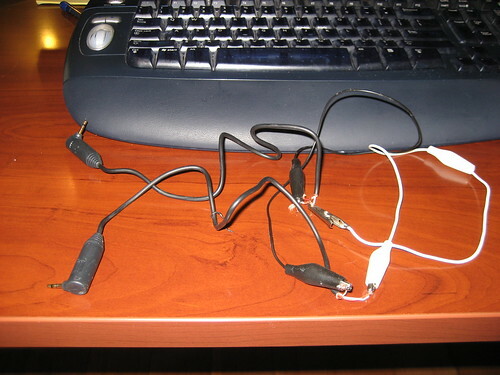 I busted out my trusty meeter and verified that 3 volts was pulsing through the cable but the camera wouldn't take a picture. After a little more poking on the web, I discovered that the signal needed to be coming out of the the other part of the jack (the tip) to trigger the shutter. The upper part of the jack simply triggers the focus. So I whipped out my wire cutters and alligator clips and fixed that right quick. After plugging it all back in together and hitting a few button the camera began to magically take pictures! Well by now I was really pumped to put this baby to work. The recent snow was melting off pretty quick so we decided to hop on the bikes and roll over to the 10 minute boulder for a tennis shoe session. It is called the 10 minute boulder because it takes about 10 minute to get there on a bike. Rolling up we were disappointed to find the left side guarded by a huge puddle. There was brief discussion to roll on to a new area but the call of the stone was too great. 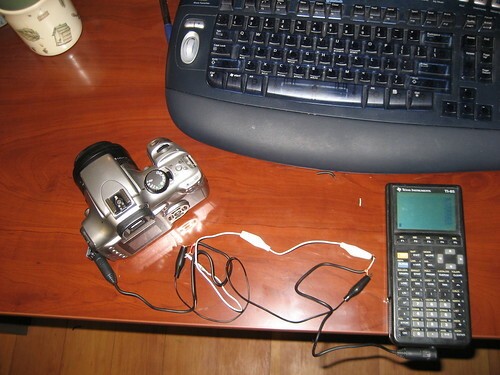 I set the camera on a tripod and taped the calculator on. We figured that we would probably boulder for about 20 minutes. Knowing that in the end we wanted a video frame rate of 15 pics per second we settled on setting everything up to take a pic every 2 seconds. It is important to set everything on the camera to manual and turn off the preview setting. I also lowered the resolution to the small setting so it would write to the card faster. After a few test shots we were off! During the session we took about 750 pics. Back at the house I decided I wanted to enhance the pics so I set up a batch session in Photoshop that automatically resized and applied a few things to all the pics. Then I found a free software called JPGVideo to take the pics and turn them into a video. Super easy to use. You just point it at the folder that has all the pics and hit the Go button. 10 minutes later you have a video. To make it nice I added some titles and music in Camtasia. Alright, so I am going to try to get back in to blogging again. Instead of trying to catch up from the last blog I think I'll just start fresh. This morning I did a quick tour up to about the tree line before work. Woke up at the horrible time of 6:15 and was on the road by 6:45. I was the second car in Bear Lake parking lot so I pretty much had the place to my self. The weather was to die for. Bluebird skies, zero wind, and about 30 degrees. The goal was to see how high I could get up Flattop before I wore out. 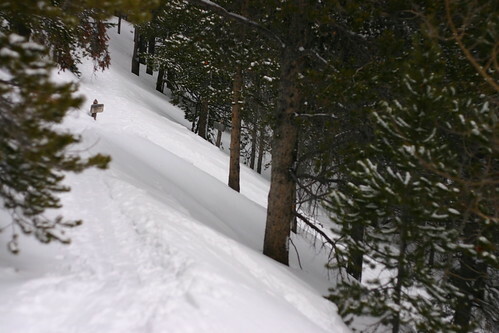 Once at my high point, I would traverse north and then ski down the bunny slope on the east flanks. The skin up went fine. The trail started out hard packed and chunky but softened as the day wore on. I managed to skin up for about an hour before I had enough and set off on north into the trees. While heading north I tried to keep a fairly steady altitude because I knew I had to pass above a large rock outcropping. After about 10 minutes I popped out onto the nice open slopes of the east flank of Flattop. Perfect for someone like me with limited ability to turn. After a quick snack and adding a few layers (anticipating some good falls) I stripped of the skins and let gravity have its way with me. I actually am starting to feel some turns now. Still pretty rough, through. Not ready for tree runs by any means. Anyhow, the climb took about 1.5 hours and the descent took about 30 minutes. Here is a short vid I captured at my high point. 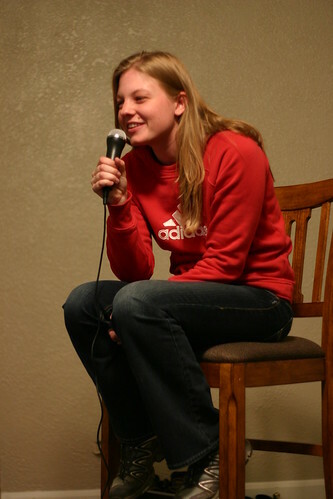 Wow, it seems like it has been a while since my last blog. It is not that I have grown tired of blogging it is just that live has been a bit crazy lately. So much stuff to do! Things at work have kicked onto high gear as we are feverishly trying to wrap up a product and get it out the door. The goal is some stable software for bug testing by the end of the month. Unfortunately I am the only one able to do the coding so that puts quite a burden on me. Oh, the joy of a small company! The good news is that we have enough projects and cash to hire someone to help me out for at least 3 months so I talked my buddy Brent from Iowa into coming out to Estes and seeing what we can do. I hope things work out well and buckets of cash roll in so I can keep him around for more than 3 months. Unfortunately, he won't be ramped up in time to help me with this end of the month deadline. I have been able to get out once in a while. 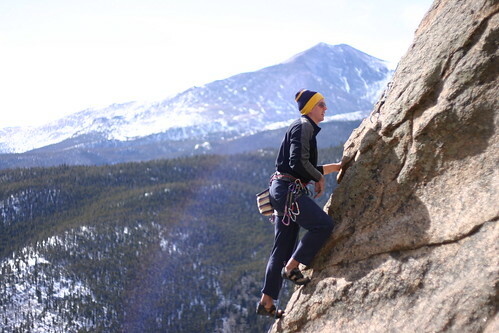 A few weeks ago we had a sunny day of climbing up a Lumpy. 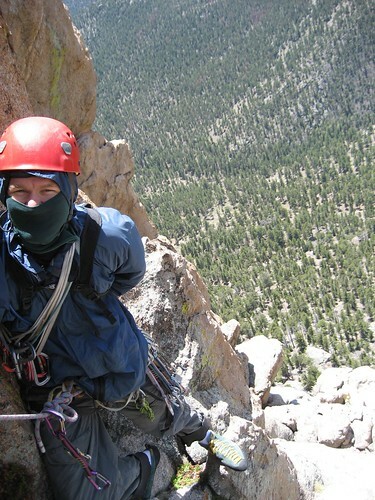 We found a nice route called Crackle Crack that consisted of bomber jambs and excellent gear. It felt good to climb a crack again. It makes me yearn for the desert. 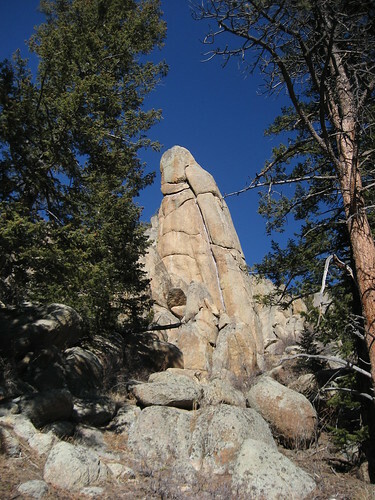 We checked out an area down in the Big Thompson canyon called Jug rock. 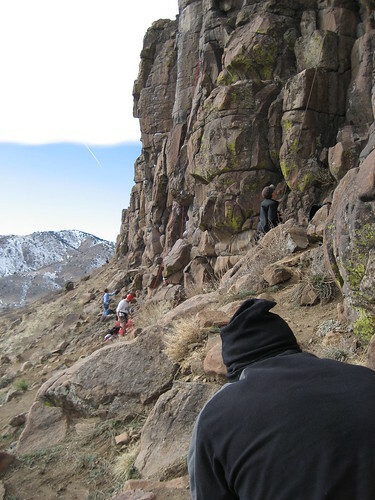 It is a sport climbing area on some strange conglomerate rock. Lots of large crystals embedded in the rock that you don't really want to trust but you have to anyway. I liked the climbing but Molly didn't care too much for it. It had a steep but somewhat short approach. So, there was a quick catchup. Hopefully, I will be a better blogger now. We'll see. I have some many things to talk about but just not enough time. I sit here exhausted on the couch looking forwards to an evening of electronic entertainment after a good afternoon out in the mountains. It is days like these that I am glad I have a TV. I often threaten to get rid of it but these are cheap plastic threats. I am so tired right now that if I didn't have a TV then I would go to bed even though it is only 5:45 and I haven't had supper yet. Reading is definitely out. I supposes I could probably just listen to the radio and watch the fire. Obviously I have enough energy to Blog but I feel myself fading quickly. Anyhow, let me attempt a short TR about what wore me out today. I had planned on working most of the day today but with a combination of getting a lot done in a little time, having a new exceptionally good idea to mull over, and bright blue skies, I quickly grew tired of my desk and began to scheme. 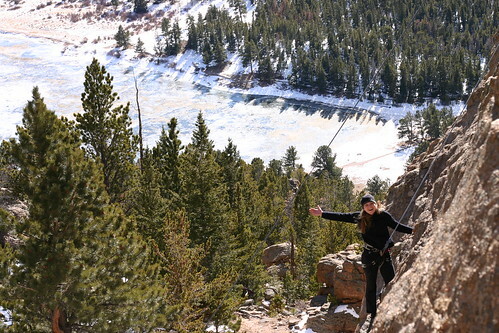 It was too cold to climb, or at least to enjoy climbing. Plus there was some of the heat sucking wind. I had a few hours so running was not ideal. I guess that left skiing, even though I just went yesterday. Molly was out because she wanted a quick workout so she could work on stuff around the house. So I threw a king sized Snickers and a liter of water into the pack, grabbed the gear and peeled out of the drive. The plan was to see how far up Longs I could go before my turn around time of 4pm. I hoped to at least get above the treeline but was really shooting for the Boulder field. As usual I was grossly overestimating how awesome I truly was. On the drive to the TH I got a clear view of Longs. You can see by the haze that the wind was whipping up there and really moving snow. Both Longs and Meeker looked like they were steaming. But it was nice down by the road so the plan was still a go. Pulling into the lot I was surprised to see so many cars. I ended up encountering about 10 snowshoeers up there. I starting huffing up the trail around 2:30, giving me 1.5 hours to see how far I could get. 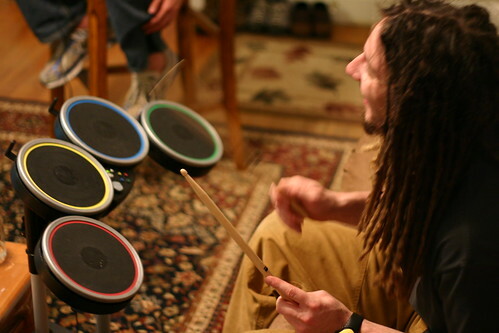 With the help of the iPod I quickly found my rhythm as I started covering ground. 15 minutes to the first junction, another 15 to the sharp turn by the creek, and then 10 more to the camping area. I had covered this far a few weeks ago but turned around just past the camping area because the trail disappeared into deep, soft, demoralizing drifts. 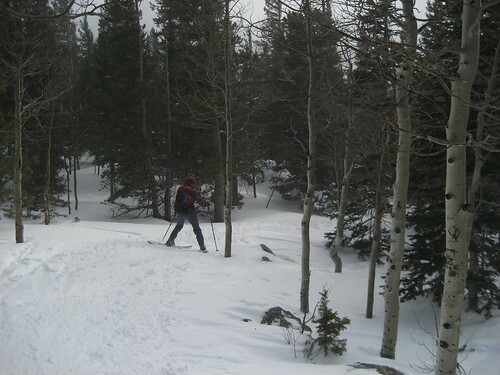 Today, thanks to all the snowshoeers there was a great hard path slicing through the trees making progress much easier. At about 1 hour it began to catch up with me. I stopped for a few and ate my giant Snickers, now frozen. If I chomped down on it I could break off a piece in my mouth and then essentially gum it down like an old man without his dentures. I tried to build a little seat in a local drift but soon realized that sitting with skis on would be problematic. Rested, fueled and starting to feel cold, I cranked up the iPod and took off for my last half an hour. The song "Wolf Like Me" by TV on the Radio gave me the motivation to set a sweaty, gasping pace. From here on out it was some pretty steady climbing. As I gained on the mountain the wind gained on me. 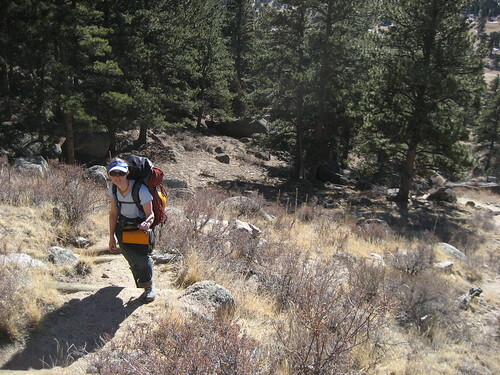 Right around 4 I was into the scrubby bush that marks the transition from forest to alpine tundra. 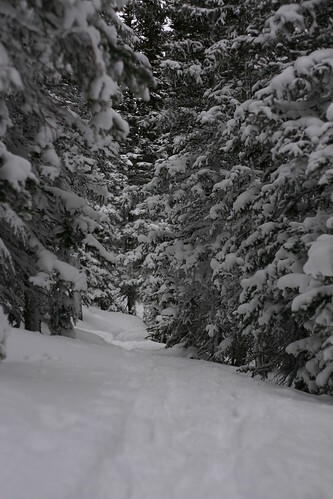 Without the trees the wind was free to roam as it pleased, stinging the face and making the snow thin and hard. The Boulder field was still a long ways off, it was my turn around time and the sun has already sunk behind longs. It was time to turn around. Here is my high point. The snow up here was rock hard so I tried to head down with my skins still on. That proved to work poorly so I stripped them and began to snowplow like it was going out of syle. On a high note, I have learned how to strip my skins without taking off my skis. It involves a lot of balance, which is a strike against me. I may of ended up in a bush but I didn't have to take em off! I think the most challenging feature about BC skiing (at least the actual skiing part) is how quickly the snow consistency changes. 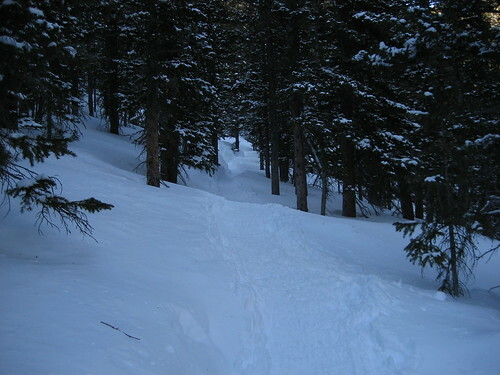 I had settled into a nice snow plow, scraping along a rather steep section of rock hard snow when it suddenly turned into a nice soft slab, pitching me headfirst down the hill into 2 feet of loose powder. I am sure it is funny to watch me crash in the mountains. 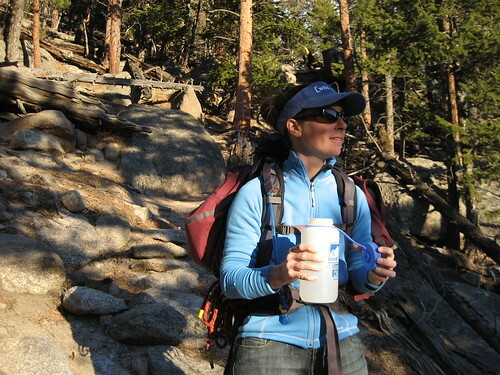 When I crash and I am alone in the backcountry, my first reaction is panic. I thrash, swear, panic, and generally wallow for a good 25 seconds. After about 25 seconds I begin to wear out, pull a muscle in my neck or the back of my arm, and rational thoughts start to get more attention. By this time, my skis (and therefore my feet) are pointed in opposite directions, a pole is probably missing, and I am kind of sitting/laying at an odd angle in my custom snow recliner. Oh, and the thrashing tends to completely cover you with snow, including your goggles, which are steamed up by now. Now I generally force myself into what I will call system reboot. I sit quietly and do a check for pain, look around to make sure no one is looking, try to pinpoint why I am freaked out, clean out my goggles, and generally come up with a plan. 5 minutes later I am back on my feet swearing to give up skiing forever. Repeat until you get back to the car. On a positive note, I am noticing that I can now get down the packed trails without much problem. I really only get into trouble when I venture off the trails into the trees. Molly and I started out Valentine's day by first sleeping in, then walking down to The Egg and I for a late breakfast, and then heading up to RMNP for a little BC ski session. Oh, I bought her flowers too! Anyway this blog is about the skiing. Quite a while ago, there used to be a small ski resort called Hidden Valley. I am not sure when, but at some point the land was reclaimed by the parks department and the ski area was shut down. Now it is part of RMNP. I have heard from several people that this is a great spot to learn to BC ski. This is because the slopes are not very steep, making them easier to ski plus greatly reducing the avalanche danger. So, with a plan we grabbed our stuff and headed out. As it turns out, Hidden Valley is also one of the few places they allow sledding in RMNP so it was packed with kids and families. 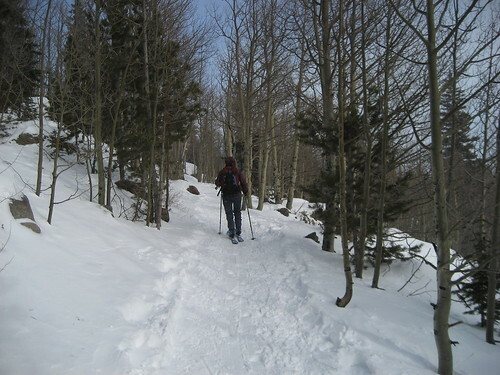 However, we quickly left the circus behind and were soon skinning through the quiet woods while fresh snow fell all around us. Here is Molly trying to catch some snowflakes on her tongue. After about an hour we decided that we had enough climbing, so we found a flat spot and stripped the skins off our skis. And here she is showing me up. She made it back to the car with zero crashes. I dug in twice. We made it back to the car in about 10 minutes. I know I had a big grin on my face. Molly is still not quite convinced that it is worth all the work but I'll keep working on her. So after a hot shower and a quick nap, we are getting our fancy duds on and heading out to the Dunraven for a fancy supper. So far, it has been a Valentines day to remember. A few days ago I needed to get out and it was too cold to go climbing so I decided to head up into the mountains for a little ski tour. After checking the internet for current conditions, I landed on a plan to go from Bear Lake up towards Lake Helena and Notchtop. 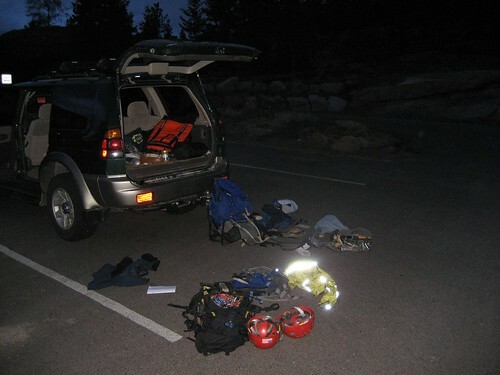 I thew some things into a pack, grabbed my gear, hopped in the car and was off. Molly was busy working on the fireplace so this was going to be a solo mission. Pulling into the Bear Lake TH parking lot I was surprised to find a mere four cars in the lot. I guess it was a cloudy Tuesday afternoon. It was a bit cold (low 20's) but the wind was absent so I knew once I got moving, I would warm up quickly. I clipped on my skis, cranked the iPod and was off and by the time I hit the first junction, I was roasting. Here is a shot looking back at the junction. As you can see by the sign, there was plenty of snow. This side of Flattop is well known for getting piles of wind transported snow. 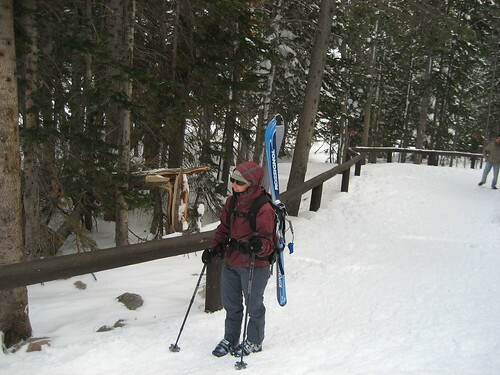 Along the way, I stopped and chatted with a friendly snowshoer who had been out since 6 am (it was 3:30!). 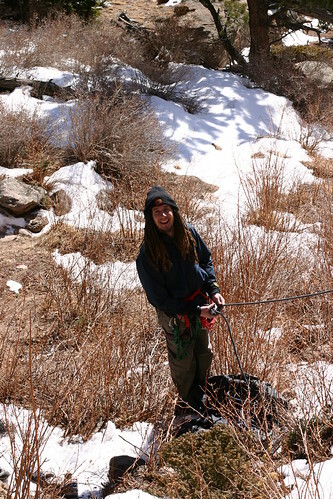 As I gained altitude, the snow got deeper and the tracks got fewer. 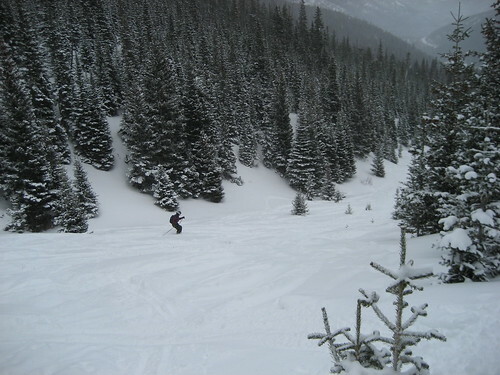 The snow was generally light powder for about 8 inches and then a hard slab. 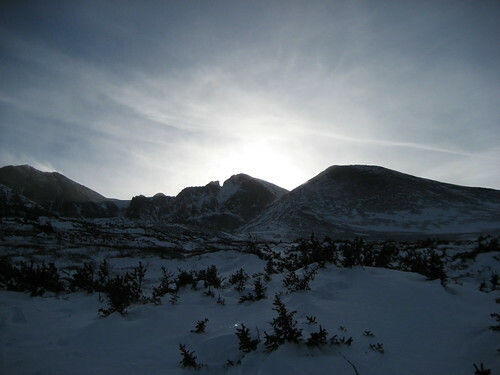 After a bit I broke out into an open meadow under the east slopes of Flattop. I had heard that this was a pretty good spot for some easy, safe skiing so I decided to check it out. I picked a safe route to skin up the hill and was soon huffing and puffing my way up. 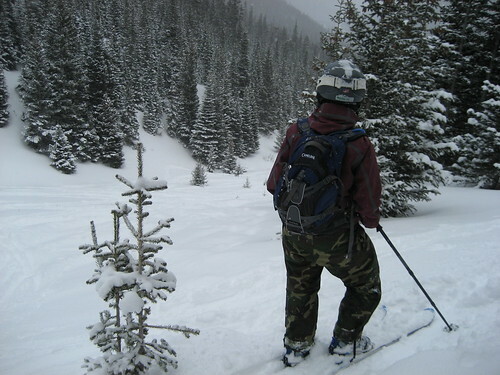 At a nice little patch of trees about halfway up the slope I dropped my pack and took off my skis. I was being very conservative and decided this was high enough for today. Below me lay a wide open 25 degree slope of untracked snow. 25 degrees is important because it is very uncommon for avalanches happen at that angle. For fun I dug a snow pit and checked out the layers. I dug down about 5 feet and still didn't hit anything. I guess those little trees sticking out of the snow are bigger than I expected. I poked around the snow a bit, trying to get a feel for the layers. 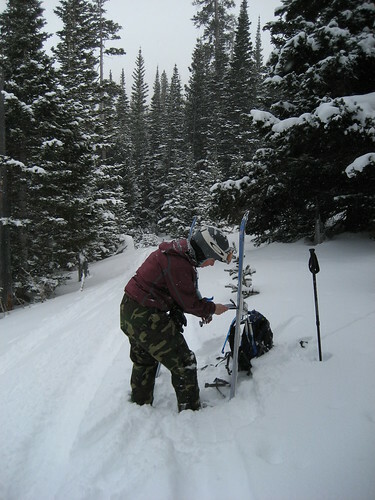 Understanding the layers of snow it a critical part of understanding how avalanches work. I tried to perform stability test where you cut out a column of snow about 2.5 feet square and them pound on the top of it with your shovel. I ended up smashing the column without any fractures or sliding, which is a good sign (I think!). After sipping some hot tea, I decided I had better start back. I stripped the skins off the skis, packed back up and clipped back in. I made it down the hill, making wide turns and only crashing twice. 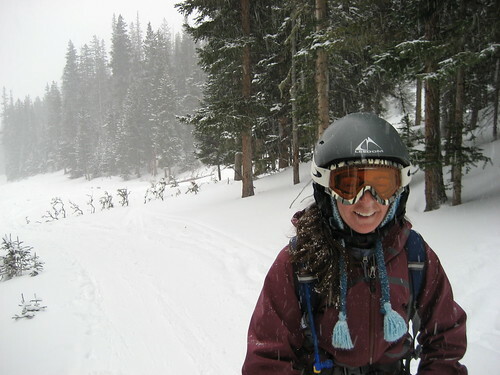 The first crash taught me a very important back country skiing lesson. When going down hill, make sure you zip everything closed. Crashing out there is like diving under water. That snow is deep and it gets everywhere! My first wreck left me completely buried and snow packed into everything. 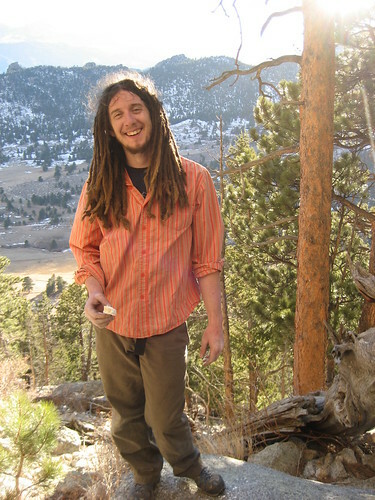 Oh, and dreads are like a snow magnet. Recently I came across a handy piece of free software called SyncBack. It allows you to setup a schedule for syncing folders on an external hard drive with folders on your computer, making it really convenient to back up important files on your computer. For example, I have it set up to back up all my work files every night at midnight, it backs up my photos every Monday night, and it backs up my music every Tuesday. Anyway, I found it very useful and easy to use so I thought I would share my experience with the world. If you want to check it out, here is where you can download it. 1) Hard! Desperate, insecure, painful, slick, overhanging finger crack. 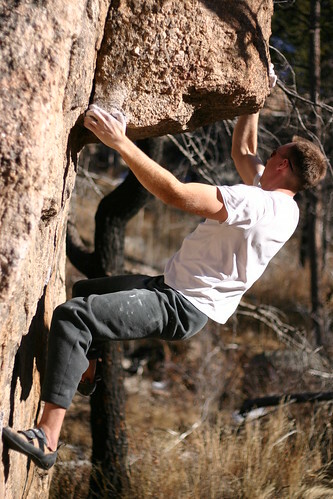 Rated 5.11b but generally accepted as a sandbag so probably closer to hard 11. 5) Approach, while about a mile long has a minimal amount of hills. So we packed the gear and headed out to receive our beating. I knew that there was going to be a lot of hanging on gear, aiding, and top roping. But as usual, what really happened was quite unexpected. After a brisk 20 minute hike we dropped packs at the base and took stock of what we were in for. Here is a pic. The route is the obvious crack arching towards the left. After some discussion, I racked up and got ready to start off. Here I am realizing how much this is going to hurt. I reached up and placed a small cam as high as I could and clipped it. I managed to find a sloppy hand jam and reached up, desperately looking for a finger lock. I found a rattly layback kind of hold and moved my other hand up for what looked to be a sinker lock but was not. The crack is kind of back in a groove, making it hard to get any locks in. Then my feet popped off and I was sailing back towards earth. Molly caught me but I was just a few inches off the ground so she lowered me. This was going to be hard and painful. Then something strange happened. Molly asked if she could lead it. So, after getting only one piece in (which I placed from the ground) I gave the sharp end over to Molly and we racked her up. And up she went! She mostly aided the crack but she made headway. After about 25 feet she came back down and let me have another crack at it. I took the rack, tied back in and took off. 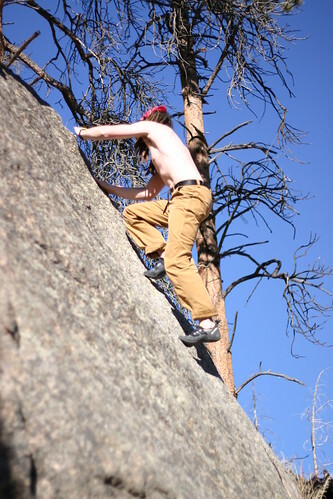 Even on top rope, the climbing was desperate and I ended up grabbing gear through much of it. I got to Molly's high point and realized that I was not having much fun. 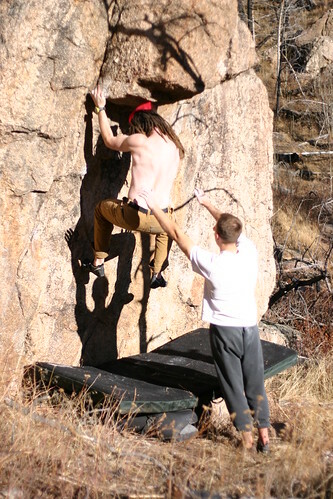 Over Christmas I jammed my finger climbing with Joe. The finger is still swollen and sore at times but I thought it had mostly healed. In hind sight, perhaps a finger crack like this was not good for it. It was throbbing and hurt to bend. I managed to place another stopper higher in the crack but could not clip it. Disgruntled, I asked for the dirt. We discussed our options. I was ready to scramble up the back of this thing and clean our gear on rappel but Molly wanted another go at it. So she racked up again and hoisted to her high spot. I am not sure how long it took her but she made it up another 20 feet or so before the sun started threatening to set. So, after a valiant effort Molly asked for the dirt and I set off to scramble up the back of this thing with a rope and something to rappel with. This also turned into somewhat of an epic. 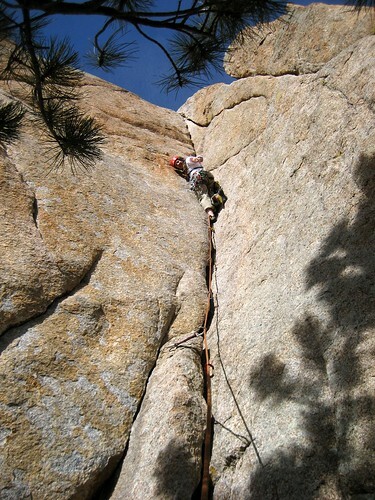 We were climbing on what was essentially two towers of granite, each about 70 feet tall. On one side there were a series of ledges that one could negotiate to get near the top. For the last 15 feet or so, you actually climb a widening chimney between the two towers. As you get higher, the towers tend to round over, making the chimney wider and wider until you have to make an exposed move to get on top of one or the other. The tower I had to get on top of was no wider than the back of a horse. Once you mount this stone horse, you have to scoot along the ridge for about 10 feet before you reach the safety of the anchors. Now if this scooting was only a few feet off the ground, it would be no big deal. However, when you are looking at 70' of air on either side... well, it is a big deal. I sat in that chimney between the towers for a long time, thinking about my options. To go back down and finish aiding the crack would put us well into darkness. Between me and all the scooting to the anchors, there were absolutely no cracks or any form of protection. Freaky. In the end, I hatched a plan that was shaky at best. 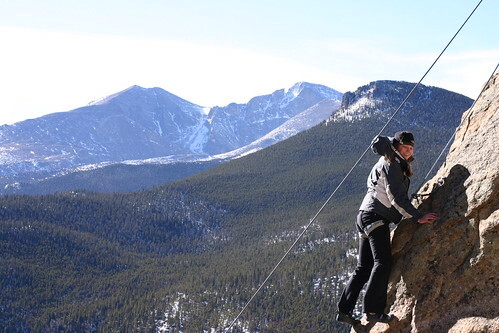 I tied into one end of the rope and threw the other end down to Molly on the ground, where she put me on belay. However, between her and I there was nothing but a sickening arch of rope. No gear so a fall off her side of the tower was not an option. However, if something were to go wrong during the dreaded scoot I could bail off the opposite side of the tower and Molly could catch me with the rope, assuming the rope stays crossing over the top of the tower. It was the best we could do so I pushed down the dread an climbed onto my stone horse. It was actually quite casual. The scoot was over in a few seconds, there was plenty of stuff to hold on to, and at the end of the scoot there was a nice place to sit and leisurely hook into the anchors. Next time I could probably do it without a rope, as long as there is no wind! 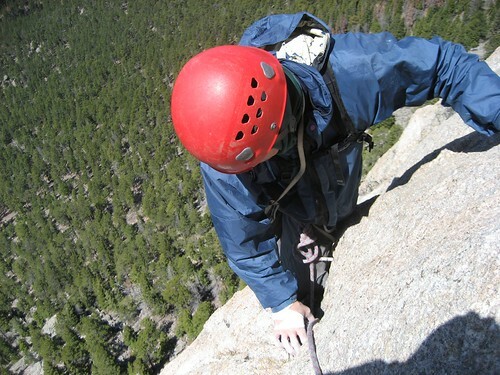 After a quick rappel down the crack and some cleaning of gear, we were packed up and headed back to the car. The day did not really go as planned but I would still mark it as a success. I was hoping for a couple day project but this one looks like it could take much longer. Plus, I'll have to wait for my finger to heal a bit more. 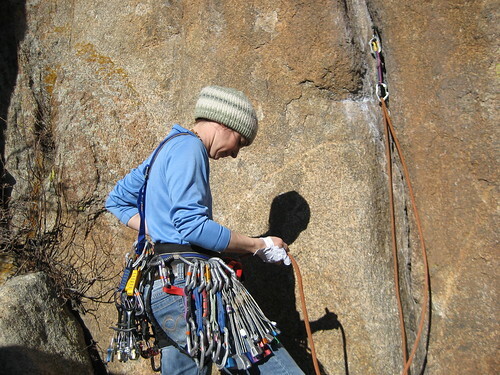 I was thrilled to see Molly volunteer to hop on the sharp end of a hard trad lead. It shows me that her confidence is growing. 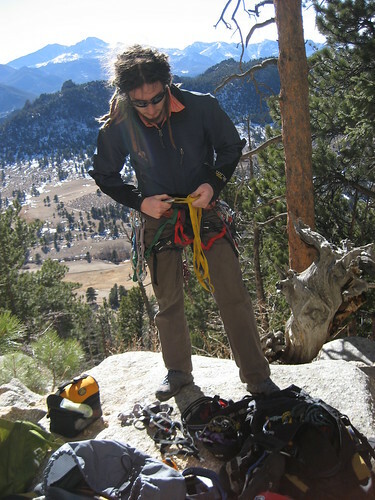 Plus aiding hard stuff is a great way to learn how to trad climb. 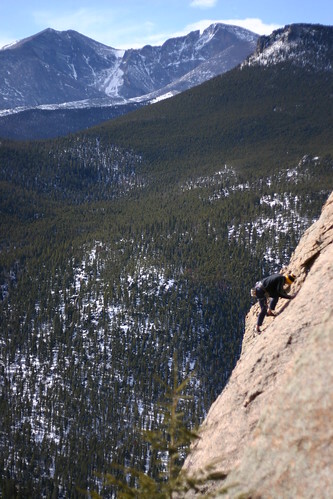 Last Saturday E and I hooked up for a little climbing down in Golden. The weather forecast looked decent for Saturday (sunny and mid 50's) so we planned on hitting Clear Creek again. There was some scheduling issues at first because Eric was supposed to cook for Tracey's parents on Saturday evening so we settled for an early start. Then Eric came down with a nasty cough. It was so bad that Tracey's parents canceled dinner! But did that deter Eric from climbing? No way! He called me Friday night and with a groggy voice routinely interrupted by fits of hacks, told me the good news. He could climb all day! So we angled for a more civilized meeting time of 9am at Noa Noa for some breakfast and java. Saturday dawned clear and bright. I could tell it was going to be a good day on the rocks. Eric was a bit late for breakfast but made up for it by picking up the tab. He downed two burritos in the time it took me to finish a bagel. That boy is a machine. His cough was better and once fed, we were set to jet. We dumped the gear into his car and roared out to the canyon. Unfortunately, we weren't the only thing roaring through the canyon. We pulled into the pullout for our cliff and the car literally shook with the wind. 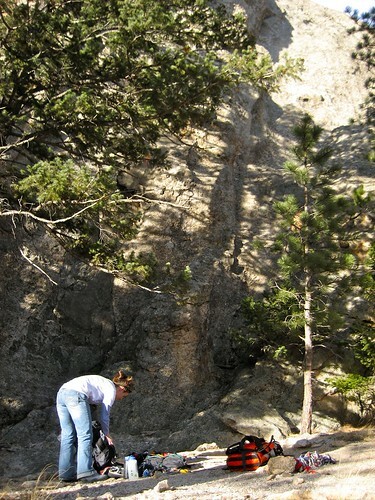 We could see where we were planning on climbing and although it was sunny, we could see trees fighting to stay rooted. A couple climbers hopped out of the car in front of us in full puffy jackets with hoods and hopped around trying to stay warm while they loaded up. Eric looked at me and said "I only brought shorts" and then broke into a fit of coughs. I looked down at his legs to verify his story. He was not lying. We needed an alternate plan. We discussed heading to the Spot in Boulder (a bouldering gym) or a climbing gym in Denver but we ended up settling on checking out the Golden Cliffs instead. 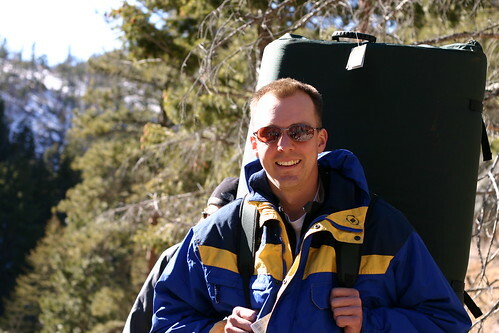 The Golden Cliffs are a cliff band at the top of a big hill overlooking the town Golden and the Coors brewery. They face south and literally cook in the sun. I had climbed there a few times before but never had much fun. The rock always seemed kind of strange. But it looked warm and out of the wind. With the help of the internet (iPhone!!) we found the parking lot, which was already nearly full. Apparently we were not the only ones looking for warm rock. Looking up at the cliffs we could see many groups either already up there or making their way slowly up the long hill. Packs were quickly thrown on after stripping down to t-shirts and sandals and an uphill slog ensued. It passed quickly because we had plenty to talk about and before we knew it, we were at the base of a cliff already crawling with other climbers. With no guide book we just picked a route that looked good and racked up. Eric took first go and easily fired the first route of the day, after which I re-lead and cleaned it. We repeated this cycle all day. I was amazed at how liberating it was to climb without a guide book. We just climbed whatever looked fun. Fortunately, the Golden Cliffs are packed with routes. Throughout the day we climbed about 8 routes and didn't wander more that 50 yards from where we started. The weather was to die for, especially considering it was January. Sunny and still. I spent half of the day without a shirt on and got my first sunburn of the year. 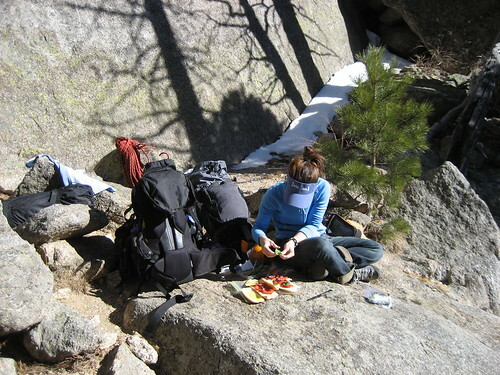 By the time lunch rolled around the crag was packed with your typical sport climbing scene. People and dog everywhere. Someone had a banjo. All the stereotypes were represented. The 10-year old leading routes that were too hard for me. The guy yelling beta for every move. The couple completely outfitted with all the latest and most expensive gear, all of it shiny, new and matching. Regardless, the vibe was fun and festive. Everybody was there to climb and have a good time. Around 4 the clouds started to build, the temps began to fall, and I was feeling worked. I could tell Eric was feeling it too so we bagged one more route (which turned out to be the best one of the day) and headed down. I ended up only taking one picture that day. Mostly because the climbing wasn't very picture worthy. 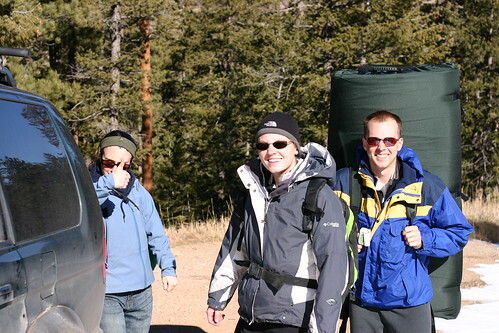 Here is a shot as we were packing up to head down. Eric dropped me off back at the truck and we parted ways, both feel exhausted. 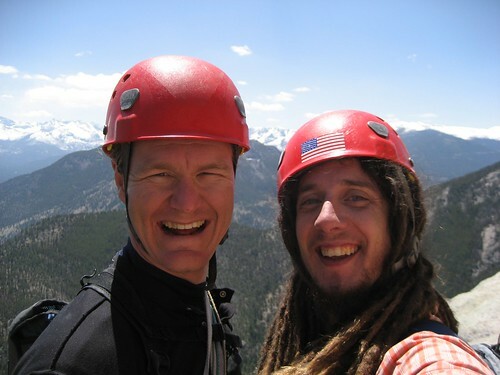 It was a great day of relaxed climbing with an old friend and no guide book. And the rock was much better than I remembered. Excellent! Last week we had some incredibly nice weather so Molly and I decided to head up to Lumpy to try a crack called George's Tree which I spied on an earlier trail run. 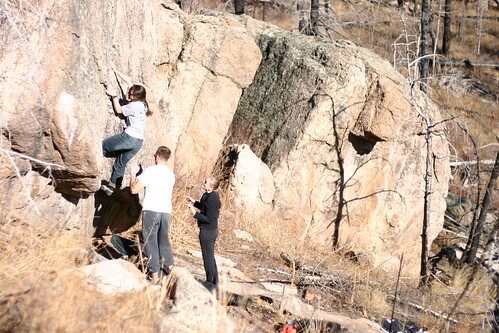 Now, it should be noted that the climbing at Lumpy has always intimidated me. The routes tend to be long and slabby with flaring cracks, which spotlights my two weaknesses: slab climbing and tricky gear. I have climbed at Lumpy a handful of times, all of which have ended with bailing early. Plus the approaches tend to be a major workout on their own! However, there is something about Lumpy that keeps me coming back. I can see the Twin Owls taunting me from my front yard. Somehow I feel that if I can successfully climb at Lumpy then I can successfully climb anywhere, which is probably pretty accurate. The grades here are very stiff and traditional. Anyway, on with the climbing. The approach was as we expected, long and steep. I think it took about 1.5 hours of toiling under heavy packs. I knew setting off that I would likely aid the route so I packed a ton of gear: 3 full sets of cams, 2 sets of stoppers, two ropes, etc. Very heavy! Here is Molly getting through the steeper section. We had planned on keeping it pretty casual, so the first priority was to make some lunch. Here is Molly making my favorite sandwich of all time. Tomato, basil, mozzarella, and kalamata olives. Oh so good!! 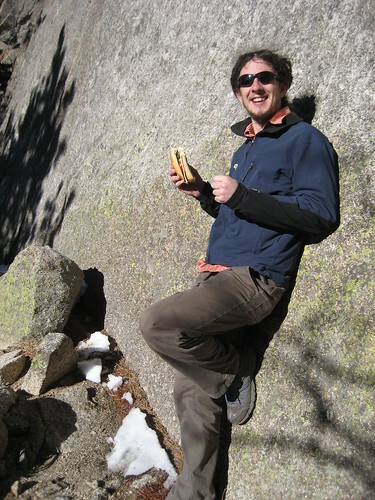 Basking in the warm sun with an awesome sandwich. The climb itself went slow. It took me about an hour to get to the bolts. However, in that hour my confidence in Lumpy rock grew exponentially. Molly did a lap on top rope and also learned a lot about climbing this new type of rock. It was fun to watch her progress. The first 10 feet involved much flailing and grunting but then she started to develop her technique and by the end of the route she was cruising. Once down, she rewarded herself with one of Tom's homemade shortbread cookies. I jumped back on it and climbed it again on top rope, this time free and felt surprisingly secure. Cookie for me! By this time the shadows down in the valley were racing up towards us so packed it up and headed back to the car with high spirits. 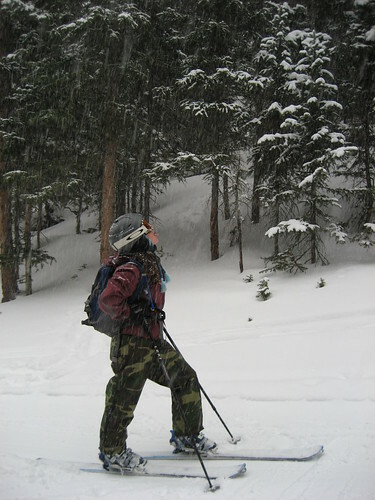 A couple weeks ago I talked Molly into heading out into the back country for a little skiing. Considering we both know nothing about how to do this, it turned out as one would expect. But hey, how are you supposed to learn if you never get out? Our biggest concern was avalanches. 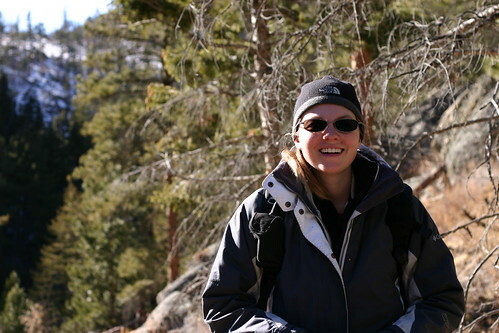 We went to an avalanche awareness clinic a few days prior that convinced Molly that certain death awaited us. I managed to get a very reluctant Molly to consider a route that would be considered more of a cross country ski trail as opposed to a downhill ski tour. Plus the avalanche forecast was favorable. The plan was to take off from Bear Lake TH and head towards Notchtop, keeping a sharp eye out for open 30-40 degree slopes to avoid. Here is a shot of us just leaving the parking lot. Right off we knew we were in for it. It was cold with a gale force wind coming off of Bear lake. Plus Molly pulled a neck muscle while putting on her skis. I felt clumsy, cold and pretty silly falling down in front of all the tourists walking around in boots and snowshoes. We skinned away from the lake as fast as possible, hoping to leave the crowds (and wind) behind. It did not take long to figure out that this was hard work! Like any new sport, this was using muscles that apparently did not get used much because we were beat after about 20 minutes. Here is Molly when we decided to turn around. So I made the silly decision to strip the skins off my skis before heading down. For those not familiar with bc skiing, to get up a the hill you stick this felt like stuff on the bottom of your ski. Then when you are ready to ski down a hill, you pull it off. 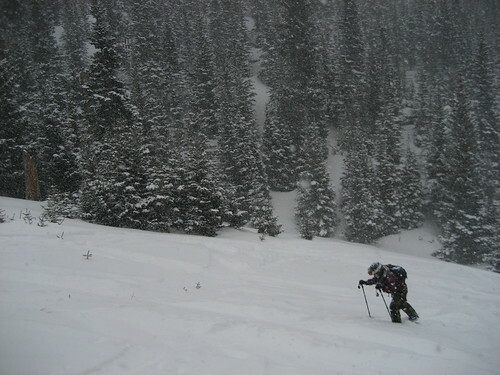 Well, I grossly overestimated my skiing skill, especially on a narrow packed hiking trail. Molly was able to snowplow like a champ. My method involved desperately grabbing tree limbs. We made it back to the TH feeling a bit dejected. Next time will hopefully go better. Be the hammer!! Yes, it is time again for my album pick of the week. This week I am going nearly polar opposite from last week's pick. Now I have a real love-hate feeling towards rap. I love the energy and flow of rap but I have very limited capacity for two major themes in mainstream rap: disrespect for women and chest thumping. I really could care less how cool, tough or rich you think you are. Anyhow, a few weeks ago we watched a somewhat disturbing Christian Bale movie called Harsh Times. One of the songs in it was Return of Tres by Delinquent Habits. After a little poking on iTunes I found the album with this song on it, downloaded it and have not been disappointed. It definitely has that Hispanic LA/Cypress Hill feel to it. Many of the lyrics are in Spanish so I really don't know what the songs are about, which may be why I like it so much. I enjoy not being able to understand what they are saying. It makes the vocals flow by like another musical instrument. Plus it is nice background music for frenzied programming. 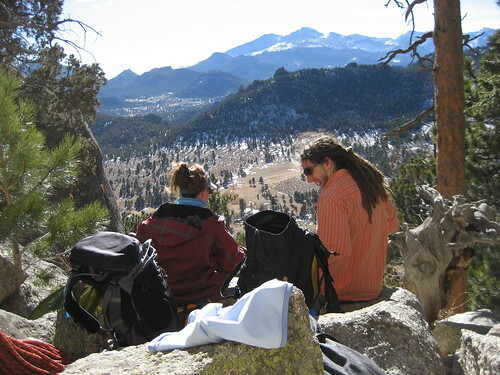 Last weekend Eric and Tracey were able to make the trip up to Estes from the Spring to spend a weekend with us. Due to work schedules, they ended up getting here pretty late on Friday but we still rocked the night away with Rock Band. 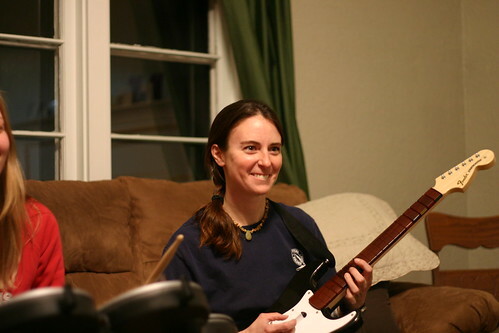 If you haven't tried Rock Band yet I recommend that you quit reading this blog and immediately make friends with someone who has it. It is a great party game. We need to pick up one more guitar and then 4 people can play at a time (vocals, drums, bass guitar, lead guitar). 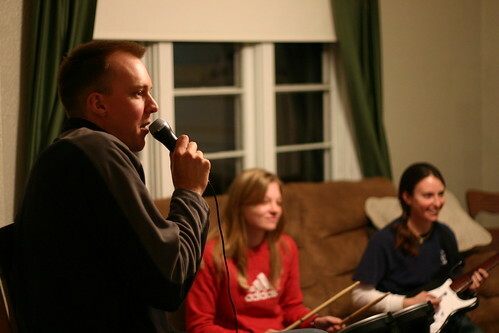 Anyhow, here is Eric tearing up on on lead vocals with his attractive band in the background. After much persuasion we even talked Tracey into singing a song. Next time you see her ask to hear "Eye of the Tiger". Saturday we woke up late and wandered up to the Mountaineer for breakfast, where Bernie (the waiter) was sure Eric had been there a few days ago with a different girl. The original plan was to go snowshoeing up in the park but the late start and beautiful weather lured us to warm granite rocks instead, so we decided to check out an new area called Big Elk Meadows which is about 10 miles out of town. We packed the crash pads and headed out. 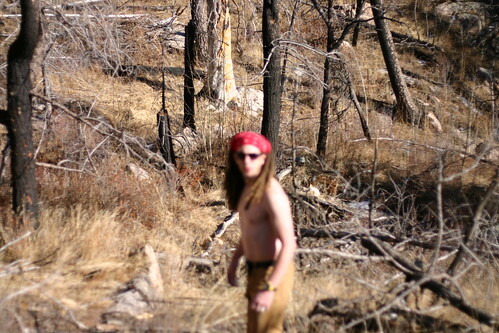 After hiking about 10 minute through the cold woods we found ourselves climbing a steep hill into the warmth of a blazing sun, thanks to an old forest fire that destroyed all the trees. 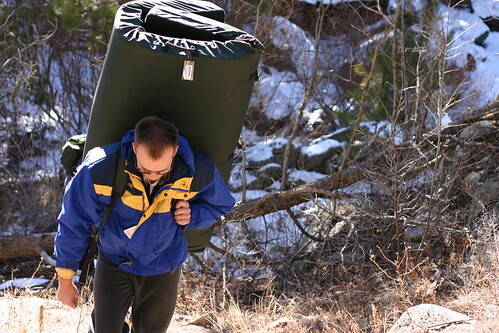 Note that I gave Eric the new monster sized crashpad to carry. I got it a few weeks ago with my Christmas money and this was it's maiden voyage. The tag is still on it! 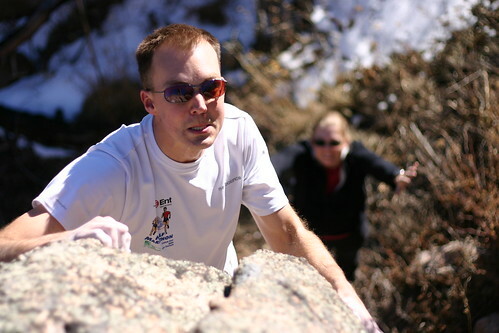 The steep hill dropped us off in the middle of a granite boulder playground known as the Dragons Nest. I am guessing the name has something to do with all the burned trees. Layers were quickly removed and shoes quickly applied. 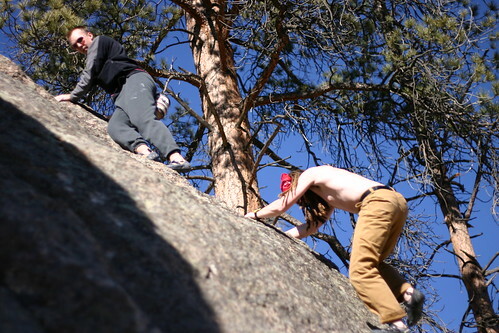 We warmed up on a few easy slab routes near the Gill boulder. 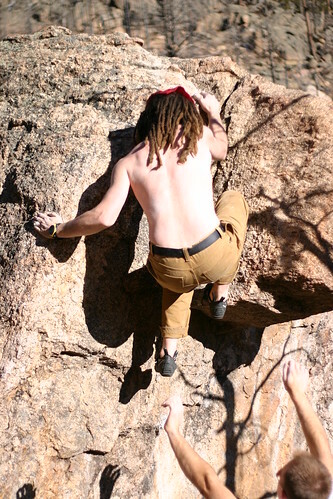 We spent some time working a sweet V3 on the Gill boulder involving bad feet and a huge throw to a crystal. I stuck the move and then chickened out on the top-out. Next time up my feet popped during the throw and I managed to simultaneously flapper both hands (def: flapper is somewhat common in bouldering where a chunk of flesh is dug out of a finger by a sharp hold and left flapping and bleeding). Glad Eric had some tape! Eric sent it handily on his next go and was man enough to pull the top-out. After all, he knows John Gill, the guy this boulder was named after. 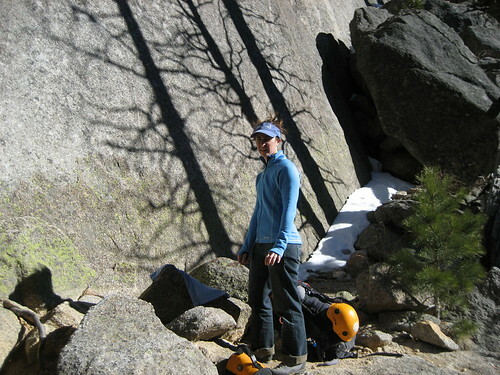 We moved on to a large boulder with a crack but it was pretty uninteresting. There was a great line on it but the landing was smack dab on a nasty pointy rock, so we moved on to the Y boulder around the corner. We moved on the the left arete. Here is Eric beasting his way up. It looks like Tracey just stuck a gymnastic move in the Olympics. This expression is not posed. I literally heard a growl. We rounded out the night with dinner at Ed's, Rock Band, Tropic Thunder, and part of Oh Brother Where Art Thou before we fell asleep. Sunday we woke up to cloudy skies and wind. Bummer. So we rolled down to the Big Horn for a leisurely breakfast while we discussed our options. 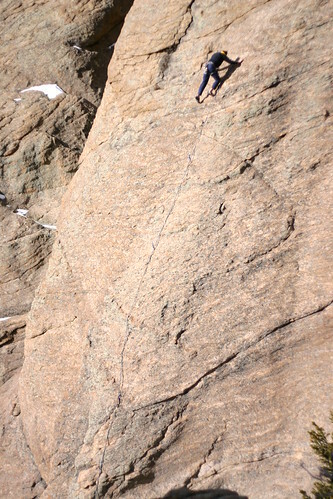 We settled on some moderate roped climbing up at Lily Lake. 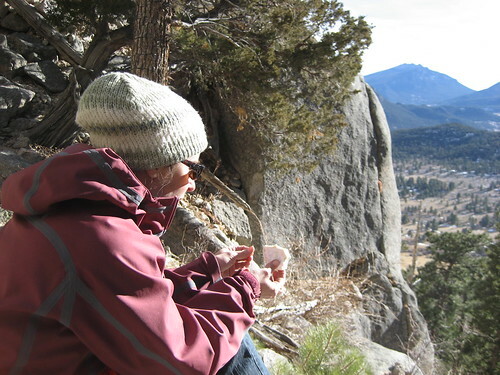 At home we packed the gear and layered up, knowing it would likely be a cold day. 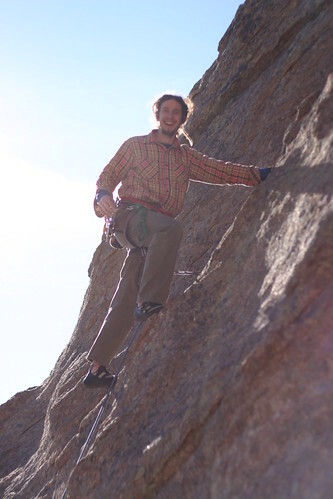 Eric got the day rolling by leading an real nice slab with an incredible view of Longs. It was a great route that we could all enjoy. Here are some shots. In the crux. It is hard to tell but the run out between the bold at my knee and the one below was pretty substantial. The climbing was easy between the two but a slip would not of been pretty. As I was nearing the clip the peanut gallery below started talking about how nasty a fall would of been, how high I was and generally messing with my head. Not cool. Fortunately, the crux was well protected. After this route, the wind started back up so we decided to end the day on a couple hard routes, which Eric easily onsighted with frozen fingers. Unstoppable. We closed the weekend down with some Indian food at the Thai Kitchen (yeah, I know) before Eric and Tracey headed back the the Front Range. It was a great weekend and we both look forward to hanging out a lot with those guys.